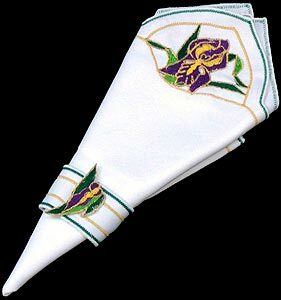 The Mackintosh influenced stylised Iris design reflects the Art Nouveau period. Louis VII adopted the iris as his emblem during the Crusades and it evolved from the fleur-de-louis into the fleur-de-lys. The three leaves symbolise faith, wisdom and valour. Pair of table napkins and napkin rings. 100% polyester.